#125 Tiny Reindeer - 13"
Will fit: 13" Dianna Effner Little Darling Dolls, 14" Betsy McCall dolls and other dolls similar in size. This 3 piece outfit is made from two coordinating fabrics. 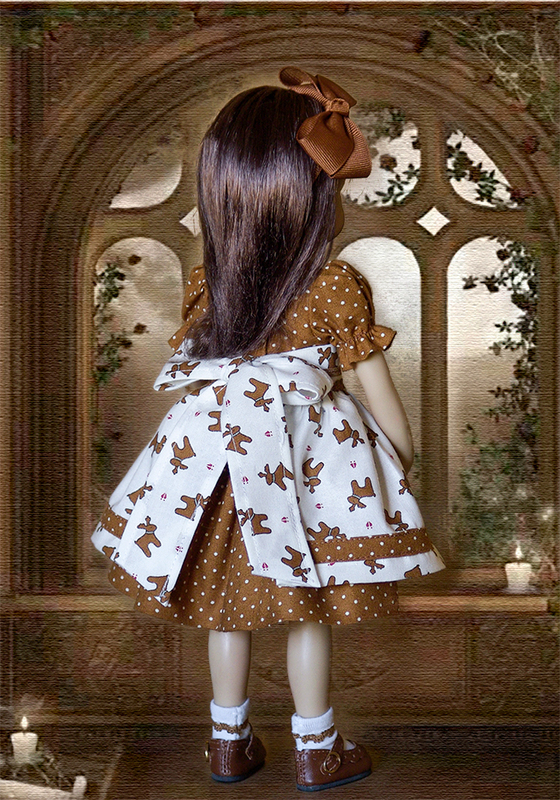 The dress is designed from a classic brown & white pin dot fabric and features short gathered sleeves. The dress has a hidden hem. The bodice is lined and fastens in the back with two-sewn-on snaps. The pinafore is made from a darling white fabric with with tiny reindeer and dainty red paw prints. Coordinating trim accentuates the waist and lower portion of the pinafore. The bodice is detailed with two non-functioning buttons. Back sashes tie into a pretty bow. The coordinating headband w/bow snaps under dolly's hair. *Doll, shoes, and socks are not included.